rods and reels, all bait and the filleting of your catch. 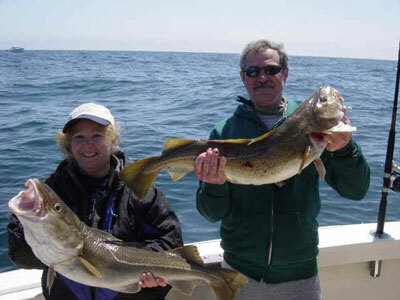 Cod, haddock, cusk, wolfish and ocean pollock are fished during the months of March through November. witness whales and porpoise feeding on our run out. Our vessel is one of the fastest passenger carrying vessels on the coast giving you almost one hour additional fishing time on an average day! 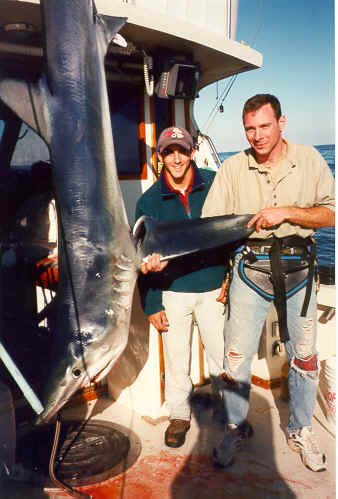 and thresher sharks are also caught occasionally. the fish performing acrobatic leaps and flips. against beast with fights lasting 1 hour or more. of cod and haddock fishing or Tuna fishing. fish these giants are the months of August, September and October. day will begin assisting the mate with the prepping and rigging of the rods and bait. Be prepared, fights can last up to 4 hours or more! We will use Shimano Tiagra 130 class reels and custom-built rods with 200 lb. test. 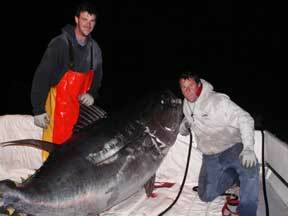 Sushi Hunter Charters is one of the top Giant Tuna producers, with fish ranging in size from 400 lbs. to over 840 lbs. On a Giant Tuna trip we will leave the dock at 5:30am and return at 5:00pm. Spend a day fishing for these powerful giants and experience the thrill of a lifetime! groundfishing for a vacation to remember. 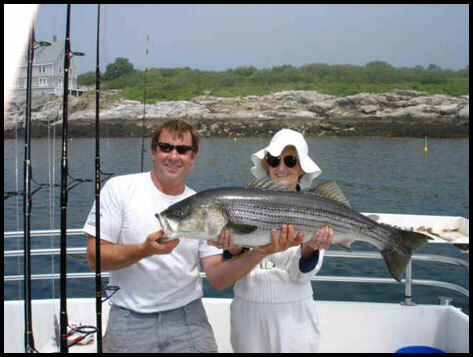 Striped Bass are an exciting and strong fighting gsportfish. They range in size from just schoolies weighing 5lbs. to big cows weighing 45lbs. or more. They are an inshore fish and are fun for the entire family to catch. The food value of Striped Bass is excellent with a nice firm texture and great taste. The season is generally mid june to mid october. Bluefish are found inshore also and are a very agressive and large schooling fish. When we locate the Bluefish it usually turns into a catching frenzy. Trolling is a common method of targeting these fish along with anchoring and chumming. We generally find the Bluefish arriving in July and staying till late September.